Ole Miss Track and Field wrapped up its season on Saturday, and a couple of Rebels rewrote the school record books in the process. Six men competed in the mile at the David Hemery Valentine Invite in Boston. The rest of the team was in Nashville for the Music City Challenge. 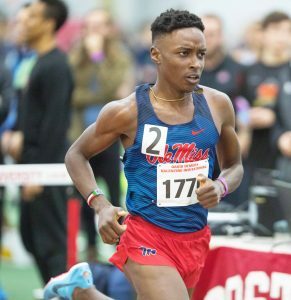 Sophomores Waleed Suliman and Maddie King each broke Ole Miss records for fastest miles run in Ole Miss men’s and women’s track history. Suliman’s time of 3:56.78 is the fastest mile run in the NCAA this season, narrowly beating Sean Tobin’s school record of 3:58.28, which was set in February 2018. Suliman, a native of Richmond, Virgina, nearly broke the sub-4:00 mark at the Indiana Relays in January when he won the men’s mile with a time of 4:01.00. He was named an All-SEC runner following the cross-country team’s success in the fall and was a second-team All-American after his freshman season. Derek Gutierrez also had a big day in Boston. Gutierrez became the third Rebel in school history to record a sub-4:00 mile with a time of 3:58.55, joining Suliman and Tobin. Three of the other four Rebels running in Boston, Mario Garcia Romo (4:03.30), Everett Smulders (4:04.65) and Cade Bethmann (4:05.08), all set new personal bests in the mile at the meet. “I thought our guys did a great job of competing in their heats and took a nice step forward as we progress toward championship season,” Vanhoy said. King, running in Nashville, broke the Ole Miss women’s mile record with a time of 4:46.45, finishing eighth. The previous record holder, redshirt-senior Shelby Brown, also competed over the weekend and ran a 4:51.26 for a 13th place finish. Chelsea Drum finished just behind King and Brown, posting a new personal record of 4:57.54 and finishing 23rd. In the 800m, John Rivera, Jr.’s 1:49:41 was good for second at the meet and seventh in school history. He was joined by Griffin Riley (1:51.76) and Shamar Tucker (1:55.09) in the top 20, with Riley and Tucker coming in fifth and 19th, respectively. The 400m dash was much of the same for Ole Miss. The Rebels had four runners in the event. Three of them placed in the top 15, and all four recorded new personal records. James Westbrook (47.39) placed seventh, 13th in school history, followed by Alvin Westbrook (48.33) who finished 12th. Orianna Shaw represented the women, finishing eighth with a time of 55.80. With the season now over, Ole Miss will prepare for the SEC Indoor Championships in Fayetteville, Arkansas, on Feb. 22-23. Following the conference championships, the NCAA Championships will be held March 8-9 in Birmingham, Alabama.